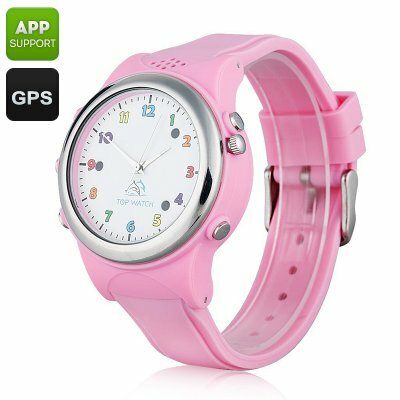 Successfully Added Kids Watch Phone With GPS Tracker - Digital Fence, SOS, Family Number, White List (Pink) to your Shopping Cart. Watch over your child with a simple and discreet accessory including lots of hidden functionality. This cute smart watch comes with a built-in GPS tracker that lets you know where your child is at any time. This cute little watch will not only be a fine toy for your child, but also a powerful security tool and a guardian of their safety. The watch comes equipped with a GPS tracker and will let you know where your child is should you ever feel worried. Moreover, the watch lets you use both GPS and LBS for more accurate positioning. A great feature the smart watch can offer is digital fencing. This allows you to set location limits for your child’s whereabouts and get a notification once these limits are crossed. For instance, you can map out the route to school and home and make sure that you child follows it with no detours. Equipped with both a microphone and a speaker, the GPS smart watch lets you listen to and communicate with your child – making sure that everything’s okay. The smart watch doubles as a phone and emergency device. You can program it to automatically call three numbers, also known as family numbers, which your child can call instantly with just a press of a button. You can also establish a white list for your kid’s phone – a list of approved numbers from which calls can be received. With a 300mAh battery, the watch phone offers up to 72 hours in standby. The kid’s GPS watch is a simple and practical accessory that can give you peace of mind and guarantee your child’s safety. While coming with a good set of security features, the watch won’t be a distraction to your child, as it doesn’t come with pre-installed games or web access. This Kids Wrist Watch Phone With GPS Tracker comes with a 12 months warranty. Brought to you by the leader in electronic devices as GPS smartwatches..